In 1901 George (15) was a teamster on a farm in Honington. In 1910 he married Mary Charity and moved to Old Somerby where he was a waggoner. In 1916 he was given an exemption from military service by the Grantham Rural Tribunal, but in Nov 1918 Mary (32) died, leaving him with their small children. George died in 1937. Richard Andrews was a farm labourer (17) at Carlton Ashes in 1911. 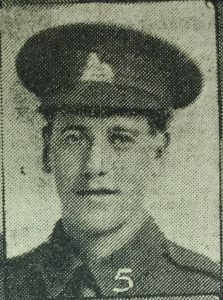 In May 1915 he joined 1/4 Battalion, Lincolnshire Regiment. On 25 Dec 1915 he sailed to join the Battalion in Egypt (along with William Edis) but a month later the unit moved to France. He was killed in action on the Hindenburg Line on 8 Jun 1917, during the final stage of the Arras Offensive. He has no known grave but is commemorated on the Arras Memorial and the Honington Roll of Honour. He was a few weeks short of his 23rd birthday and had not had leave since leaving England in 1915. His sister Harriett married Thomas Preston. She died in Netherfield in May 1930, aged 42. Alice married George Henry Phillips. She died in Peterborough hospital in November 1930. Meanwhile, in June 1930, Rosie married Arthur Earnest Head of Sudbrook. The father, Robert continued to work on Mr Faulkner’s farm at Honington until he was 72. Sarah Alice died in 1931 whilst visiting family at Woolsthorpe by Belvoir. Robert was also visiting Woolsthorpe when he was taken ill in 1935. He died in Grantham hospital. Both were buried at Woolsthorpe.